We recently visited our friend’s farm in Central Queensland (a gruelling 8hr drive with 3 kids!). We put together this list of 100 quiz questions for road trips to pass the time. My kids love being asked quiz questions. They delight in getting them right and hopefully see the learning element in the questions they get wrong. Our list of quiz questions for road trips is a mix of questions that would suit ages 4-12. It was perfect for the long road trip but would also be great to use these to extend your family time around the dinner table. Matter of fact, we also have a list of family quiz questions that we love answering at dinner time. So check those out too. But back to the road trip – because every family knows what I’m talking about when I say that we need help on the road! There’s only so much time that a kid is happy with their head buried in an iPad. Some kids can’t actually watch a movie or read a book while travelling at all. That’s when these quiz questions really come into their own. It’s a fun activity that everyone in the family can get involved in. Even the driver. What number is on Lightning McQueen in Cars movie? Name two liquids a tanker truck could be carrying. Who is the leader in blue of the Teenage Mutant Ninja Turtles? What is a flying dinosaur called? How many days in a fortnight? Who sings “Can’t Stop The Feeling!”? What’s the name of Donatello’s weapon in Ninja Turtles? What is a labradoodle a mix of? What’s the teacher’s name in Peppa Pig? 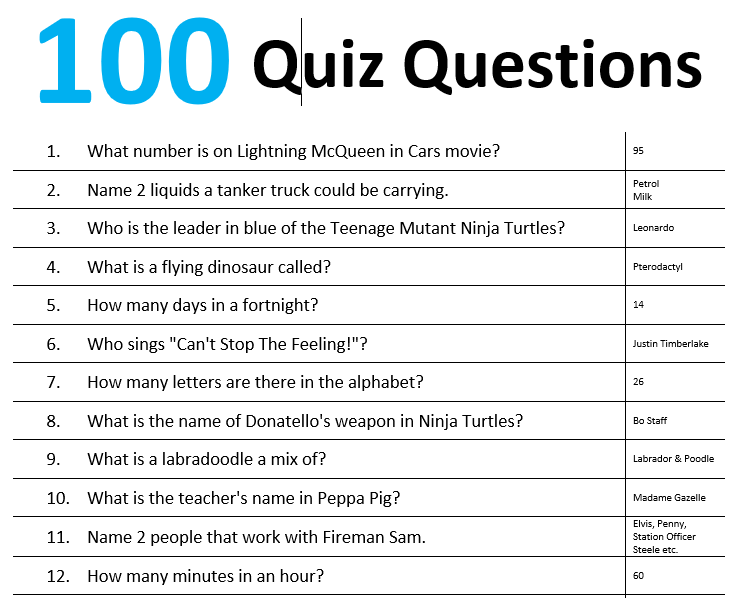 Click here to download a free printable of the 100 Quiz Questions For Road Trips. If you would like even more fun, then click here for our previous post 50 Fun Quiz Questions.